The industrialization of Newfoundland and Labrador's fisheries during the latter half of the 20th century dramatically changed the way fishing people in the province worked and lived. As the centuries-old saltfishery gave way to a fresh-frozen fishery in the decades following World War Two, the scale and nature of the industry changed. Increasingly efficient gear allowed fishers to harvest unprecedented amounts of cod and other marine resources, while large trawlers and longliners replaced less-powerful schooners, dories, and punts. Processors worked in company-owned fish plants instead of on family-owned flakes and received cash wages instead of merchant credit. The industrialization of Newfoundland and Labrador's fisheries during the 20th century dramatically changed the way fishing people in the province worked and lived. Photographer unknown. Courtesy of Library and Archives Canada (R5434 C-002545). Changes within the fishery affected settlement patterns across the province and altered the demographics of many fishing communities. Settlements close to processing facilities often grew in size, while those further away leaked population to larger centres. Government-sponsored resettlement programs also encouraged the centralization of outport populations in large growth centres. Although most communities were still located on the coast and close to productive fishing grounds, they were fewer in number than at the start of the century and usually had larger populations than traditional fishing communities. Out-migration from rural areas became an even greater problem in the 1990s, when the collapse of the cod stocks prompted many young people to move away in search of employment. At the end of the 20th century, many outports were left with aging and contracting populations. The salt-cod fishery was the backbone of Newfoundland and Labrador's economy for much of the 20th century. It encompassed three branches: an inshore fishery off the island's coast, a summer Labrador fishery, and an offshore bank fishery. The inshore fishery was the largest of the three and was a seasonal, family-based industry. Fishers left their coastal homes early each morning to row or sail to nearby fishing grounds in small open boats and returned with their catch when their vessels were full. All family members helped with the curing process, which involved removing the fish's head, spine, and guts, salting the product, and spreading it out on wooden flakes to dry in the sun. Once the drying phase was completed, fishing people traded their catch to merchants in return for supplies and credit. 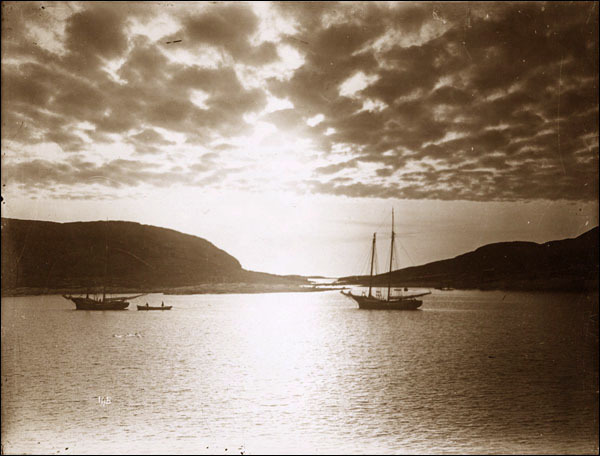 Some island fishers also sailed to the Labrador coast each summer to catch fish there, although this practice fell into decline after the 1920s. The Labrador fishery was particularly beneficial to people living in areas where the shore fishery was overcrowded or where cod stocks were depleted due to overfishing, such as at Conception Bay. Two groups prosecuted this branch of the saltfishery: stationers established a base on shore and fished each day from small boats, while floaters lived onboard their fishing vessels and travelled up and down the coast in search of cod. Some Newfoundland fishers sailed to Labrador each summer to catch fish there during the early decades of the 20th century. Photographer unknown. Reproduced by permission of Archives and Special Collections (Coll. 137 22.06.001), Queen Elizabeth II Library, Memorial University of Newfoundland, St. John's, NL. The final arm of the industry, the offshore bank fishery, required fishers to work far from their homes for weeks at a time. Fishers typically sailed to the Grand Banks in wooden schooners, sealing steamers, and other ocean-going vessels during the early decades of the 20th century. Once on the banks, fishers rowed dories and small open boats to nearby fishing grounds early each morning to catch cod with handlines, trawl lines, and jiggers. They returned to the larger vessels several times each day to unload their catch, which they also gutted, split, and salted while at sea. Vessels made up to four trips to the banks each season, which typically ran from March until October, and remained there for weeks before returning home. It was largely men and older boys who prosecuted the bank fishery, leaving their other family members at home. Advances in harvesting and processing technology after the Second World War resulted in the gradual industrialization of Newfoundland and Labrador's fisheries. Inshore fishers increasingly used diesel-powered longliners instead of small open boats, while trawlers (also known as draggers) replaced schooners in the bank fishery. More efficient nets, tracking devices, and other gear allowed workers to harvest more fish than ever before, while stronger boats allowed them to remain at sea for longer periods of time. 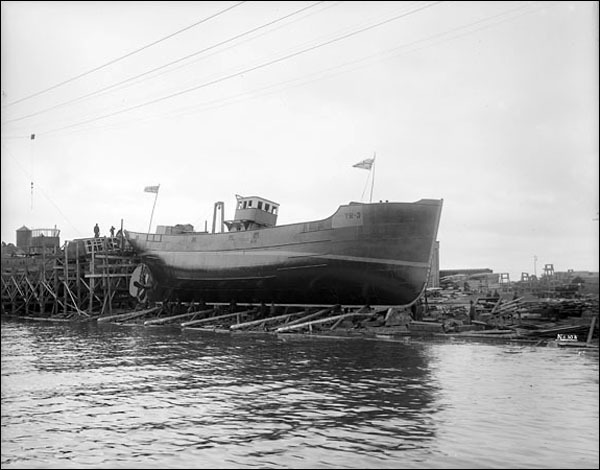 Steam and diesel engines became more widespread during the early portion of the 1900s and allowed trawlers (also known as draggers) to replace schooners on the Grand Banks. Photographer unknown. Courtesy of Library and Archives Canada (e002713141). Following Confederation, the industry shifted away from the family-based saltfishery toward the industrialized frozen fish sector. Fishers sold fresh fish to processing plants for cash instead of curing their catch and trading it to local merchants. Major changes also occurred in the processing sector. Rather than drying saltfish on family-owned flakes, fishing people worked on assembly lines at company-owned fish plants. Their jobs could include skinning, filleting, deboning, or packing fish for export to North American markets. 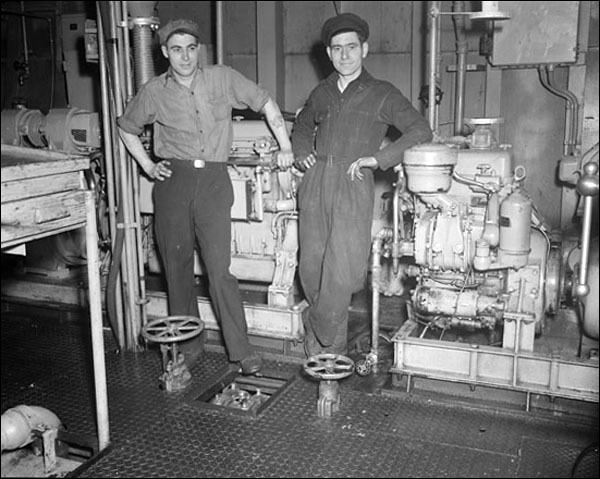 Workers in the banks fishery processed their catch at sea aboard large factory freezer trawlers. As fishing technology became more efficient, the industry became less sustainable. Decades of over-fishing severely depleted cod stocks until they collapsed in the 1990s. The Canadian government imposed a moratorium on the Northern cod fishery in 1992, which put about 30,000 people in Newfoundland and Labrador out of work and ended an almost 500-year old industry. 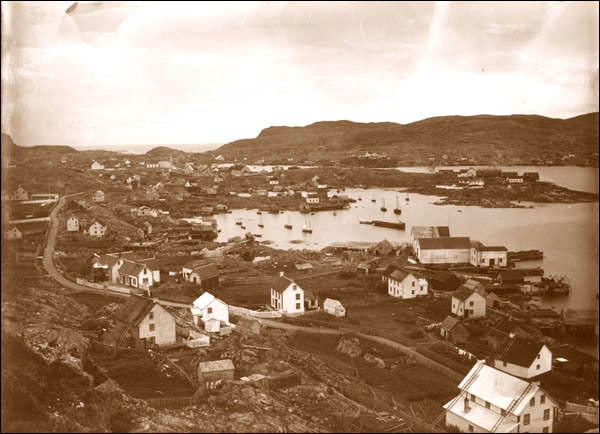 Throughout the 1900s, Newfoundland and Labrador's settlement patterns reflected its centuries-old dependence on the saltfishery. The vast majority of all settlements had relatively small populations at the turn of the 20th century and were scattered along the coast, often near productive fishing grounds. As a result, residents had easy access to cod stocks and plenty of land on which to build flakes, stages, and other structures associated with the fishery. The 1911 census recorded 1,447 settlements with an average population of 167 residents per settlement. When fishing areas became overcrowded, excess population often moved to other coastal areas, resulting in a pattern of small communities dispersed along an extensive coastline of harbours, coves, and peninsulas. The vast majority of all Newfoundland and Labrador settlements had relatively small populations at the turn of the 20th century. Photo by Robert Holloway. Reproduced by permission of Archives and Special Collections (Coll. 137 13.12.002), Queen Elizabeth II Library, Memorial University of Newfoundland, St. John's, NL. As the fishery became increasingly industrialized after the Second World War, settlement patterns shifted to reflect changes within the industry. Although the vast majority of communities were still located near the coast, they decreased in number and increased in size. This was due in part to the replacement of small fish flakes with large processing plants able to employ hundreds of workers. Families often migrated to areas that supported or were nearby plants to obtain sought-after employment in the processing sector. The 1945 census recorded 1,379 settlements, with an average population of 233 people per settlement. At the same time, state-sponsored resettlement programs encouraged the centralization of Newfoundland and Labrador's population in designated growth centres. Between 1954 and 1975, about 24,000 people abandoned more than 315 rural villages to live in large centralized communities; by then, the province had fewer than 1,000 settlements, each with an average population of approximately 500 people. Federal and provincial government officials hoped the controversial programs would reduce the costs of providing electricity, roads, schools, and other services to hundreds of remote communities. The 1992 moratorium brought further changes to the nature of settlement in Newfoundland Labrador, most strikingly to the demographics of outport communities. Although migration from rural areas to urban centres had long been a fact of life in Newfoundland and Labrador, the scale of outmigration intensified after the cod fishery collapsed. With 30,000 people suddenly out of work, many people moved from outport communities to other parts of the province and country in search of employment or education. Rural settlements experienced a net loss of approximately 48,000 people between 1991 and 2001, leaving many fishing communities with populations that were both older and smaller than ever before.